G�sta Kruse was born 1927, son to Theodor Kruse, (son to Hedvig Andersson from Sweden) horse trainer and stable master at Trolle Rhodins Zoo Circus in Sweden. Theodor Kruse died during the tour in Istanbul, Turkey in july 1954. G�sta Kruse started, 18 years old, working with two new bought elephants Birka and Safari at Trolle Rhodins Zoo Circus, and was also trained by Hugo Schmitt, who stayed with Zoo Circus 1944-1947 with five elephants from Circus Hagenbeck. 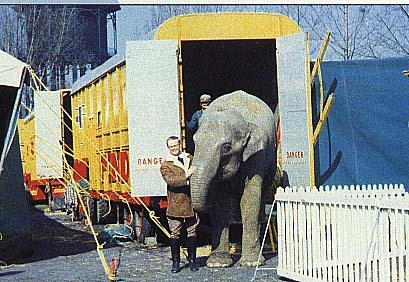 1951 took over the elephants from John Gindl as head elephant trainer on Bertram Mills circus. At the close of Bertram Mills Circus tenting show 1964 Gosta took over the elephants of Cirque Pinder in France where he remained until his death July 25, 1973 from a heart attack. In the french town Chanceaux-sur-Choisille he was honored, when a street was named "Rue Gosta Kruse" after him. The Elephants of trainer Gosta Kruse, Cirque Pinder, 1969.